The good news is, I managed to submit Purity for the IGF deadline at the beginning of this month. Download the (Windows) build here. Sadly, the day job is now ramping up such that I can’t really justify spending any more time on Purity until the big project ships, sometime next year. As it was, Purity limped in over the deadline at about an alpha level of completeness and polish. I’m proud that I was able to do that in the time I could spare, but it’s really more of a gesture at what I’d like the game to grow into than anything. All the same, I’d love to hear what people think of the game in its current state. This entry was posted on Saturday, November 22nd, 2008 at 5:41 pm	and is filed under purity. You can follow any responses to this entry through the RSS 2.0 feed. Both comments and pings are currently closed. So I gave it a shot. Ran into some technical difficulties after changing graphical settings but got to play around a bit before that. I ran the tutorial, stepped into the box and looked at the eyeball, but then nothing else happened. I wanted to play with some of the cool maps I’ve seen on your machine before so I opened up the readme to find that you can load maps through console commands, but browsing the directory structure I couldn’t find additional maps by name. Any time after this that I tried to open the game it would crash, which I’m guessing is due to graphics settings changes I’d made. Hmm, sounds like something got horked. If the game is crashing on startup, you can try just resetting your configuration by deleting the “Purity” directory somewhere in your \Documents and Settings dir. I haven’t heard of anyone not being able to get out of the first room of the tutorial map, but there might be a player direction failure there I didn’t address. The in-game menus for loading SP maps and connecting to MP servers aren’t really functional – I didn’t have time to fix up much of any meta-game stuff. Thanks for checking it out. Sorry your experience wasn’t smoother. I’ve sacked my QA department over this. Well, I played to hoal tuutorial, an I found the gameplay ideas very good. I enjoyed my time, and it sure feels like a totally new experience. I’m just wondering what “thing” are we controling? Well anyhow, very nice, it feels new, very new. very cool dude! I just started playing and enjoyed every second until it crashed just after the slingshot test (in front of the 3 objects). Also, I had some difficulties in understanding the wallclimb, somehow the explanation is not 100% accurate imho. But that can be considered part of the game 🙂 once you get the hang of it, it’s ok. I really love how you first introduce us to the separate mechanisms and then take it to a whole new level by combining them. I’m impressed! 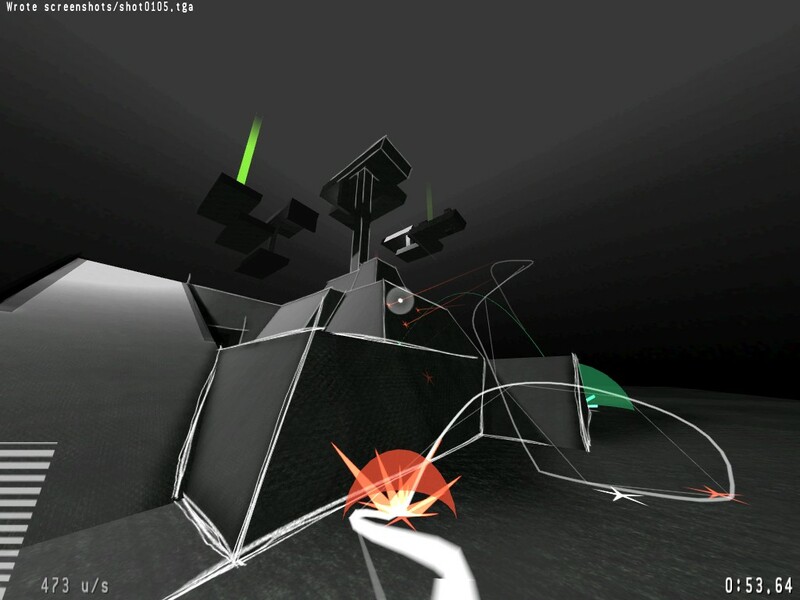 Very, very nice game; it’s a really refreshing/original take on the first-person viewpoint. I like how you’ve given the player powers that can interact with each other, that specifically work well in first-person, and that have such a huge potential for clever map design. It’s great having a platformer like this that requires a great degree of learned skill, reflexes, and fine motor control while still retaining a heightened sense of immersion. Games like Mirror’s Edge, Assassin’s Creed and the new Prince of Persia from the same engine all have similar goals to yours: interesting art style and 3D explorative platforming, but they all feel too repetitive due to the nature of the player’s control over his/her avatar’s movement. I had a heap of fun just playing the tutorial, but how do you open the other maps available (run1, run2, commons)? P.S. Best of luck with Sea of Dreams, the original was amazing. Cortout, I found the easiest (only?) way to do it is to quickly fire a BOM into a bottom corner of each of the three boxes which contain a doormand (door-diamond, hurr hurr), let their green transparent spheres expand a bit, then sweep the mouse across with a TRASE, hitting them all in one motion. If you hit the doormands directly the the BOM, they activate instantly (ie detonate on contact). The levels were really fun to just explore and muck around in. Due to the simplicity of the level design, I can see a *huge* potential for user-created levels. Thanks for checking it out and for the feedback, folks! This is indeed the “intended” solution, it’s just not nearly as obvious or elegant as I’d have liked. Next time I revisit the tutorial map I want to either improve or eliminate this. Love the idea and graphic style, it’s beautiful and will be a lot of fun! It’s been a year, time to get working on it again! I want to see this go through to completion. I’ve been on a binge of relistening to Idle Thumbs podcast episodes, and I heard you talk about this little project and felt compelled to check it out. I only played the tutorial level, but I thought I should let you know that I found the gameplay mechanics extremely compelling, fresh, and fun. I thought that was especially poignant considering this is more than two years old. I wondered if you had done anything new with this project, and if so would you share it with the world? Hi, thanks for checking out Purity and for the kind words. Like I say on the project’s page, it is definitely a project that I intend to return to someday, but I haven’t done anything substantial on it since the IGF 2008 (sheesh, I feel older) submission. I’ve numerous people tell me that the “run” (racing) mode is the most interesting part of it, and I tend to agree so when I do pick it up again that will probably be what I focus on.